Artist's concept of the New Horizons spacecraft as it approaches Pluto and its largest moon, Charon, in July 2015. On Dec. 6, the spacecraft is coming out of hibernation for the last time before it begins taking data. 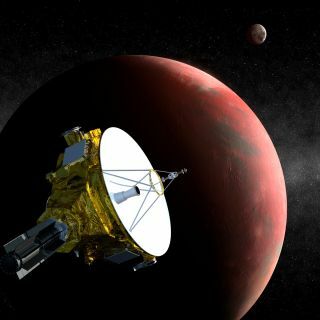 A NASA spacecraft will wake up from its final nap today (Dec. 6) to begin preparations for an epic encounter with Pluto and its moons in 2015 that will cap a nine-year trek to the edge of the solar system. The New Horizons spacecraft left Earth in January 2006 and has traveled about 2.9 billion miles (4.6 billion kilometers) on its way to study Pluto and its largest moon Charon, a few smaller moons and more objects in the Kuiper Belt. The mission has already captured images of Pluto and Charon, but nothing like what it will see on its closest approach in July 2015. At 3:30 p.m. EST (2000 GMT) today, the probe's main computer will start waking up the rest of the instruments from their last hibernation. Then, at 5 p.m. (2200 GMT), New Horizons will send a simple confirmation message to scientists at the Applied Physics Laboratory at Johns Hopkins University. Moving at the speed of light, the message will take 4 hours and 25 minutes to travel all the way back to Earth. "It's tremendously exciting because even though we've hibernated 18 times and recovered each time, this is the one that really counts," said Harold Weaver, project scientist for the New Horizons mission at Johns Hopkins APL. New Horizons will begin taking data on the Pluto region in January. Only four other space probes have traveled as far out into the solar system as New Horizons. It will be the first space probe to make a close approach of Pluto, coming within 7,767 miles (12,500 km) of the dwarf planet's surface. The probe will continue on past Pluto and into the Kuiper Belt: a disc-shaped region of icy, rocky bodies that studies show may be the most densely populated region of the solar system. According to Weaver, studying the Kuiper Belt could offer scientific insight into how our solar system formed. "[With New Horizons], Pluto and its satellites, and the Kuiper belt, […] won't just be unresolved objects or highly pixelated smudges. They'll be real world objects, with complexity and diversity," Weaver saild. "We'll finally be able to see what they look like."